Real wood is the most sustainable, renewable and economical decking and fencing option you can use, and Viance offers improved wood treatment solutions that allow the beauty of real wood to shine through. Ecolife Stabilized Weather-Resistant Wood is fully protected against termite attack and decay, and the proprietary treatment also stabilizes the wood structure. 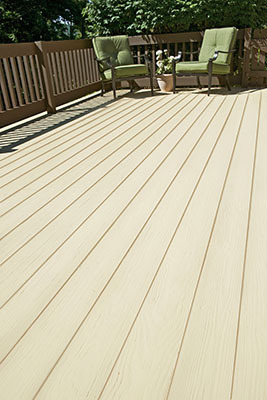 Ecolife Stabilized Wood significantly reduces the problems of bending, twisting or warping that affect many other treated wood products, so Ecolife performs much better as the structural frame beneath any deck surface. Visit treatedwood.com. Horizontal bar railings for your home or office typically require onsite welding and fabrication. A new railing system from AGS Stainless changes that with a component-based horizontal bar rail system that is fabricated in its entirety at the factory. The experts at AGS Stainless help you design the system; create all the installation drawings and do the welding, fabricating and even finishing. Installation is quick and easy, requiring only a few simple hand tools. Visit www.agsstainless.com. Available in aluminum, brass, copper or powder-coated finish, QuickCaps fit any 4×4 post to protect the end-grain from water damage while decorating a fence or handrail system and emphasizing the woodwork. To install, just mark the center of the post, position the cap nail on the center mark, then use a rubber mallet to drive the QuickCap into the post. Visit www.hometops.com or www.kokille.com. Post Shields are a simple low-cost solution to conceal and protect mailbox, deck, pergola and fence posts from unsightly damage caused by lawn equipment. Lawnmowers and grass trimmers damage the bottom of posts, and the exposed wood will deteriorate faster, look unsightly and attract insects. 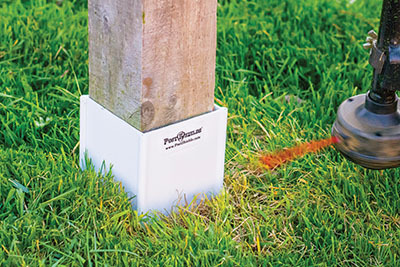 You can now affordably protect your posts and maintain the beauty of your home with Post Shields, which look great and are easy to install on new or existing posts with no tools necessary. If your posts have already taken a beating, you can use Post Shields to cover the damage and immediately stop further destruction. Post Shields provide a beautiful and sharp look to your landscape whether they are there to hide damage, protect, or just look great. They’re available in multiple colors, post and height sizes. Visit www.PostShields.com. 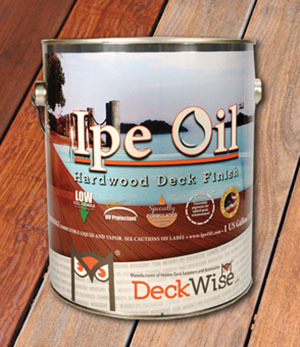 The Ipe Oil Hardwood Deck Finish from DeckWise brings out the natural wood color on hardwood decks. 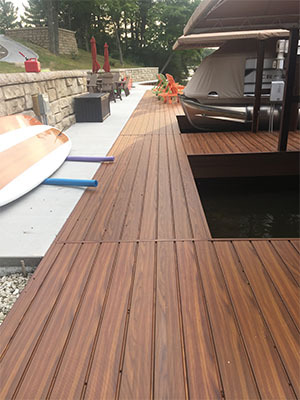 The finish penetrates even the most dense exotic hardwoods to seal and protect deck boards while conditioning the wood fibers at the same time, maintaining a totally natural wood appearance. Apply Ipe Oil to Ipe, Massaranduba, Tigerwood, Cumaru and many other hardwoods to preserve the natural exotic beauty of your decking. 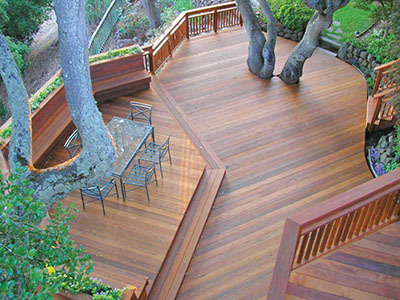 Ipe Oil Deck Finish is formulated as an oil-based natural wood finish with low VOCs and designed for exterior hardwood decks. It is specially prepared to inhibit splintering and warping of even the densest hardwood deck boards on the market and delivers a strong UV-protection barrier on the wood. Visit www.deckwise.com. The Grabber Joist Jaw is a handy accessory for professional wood framers that works like a second pair of hands. The Joist Jaw holds up rafters and joists, eliminating the need for two people. 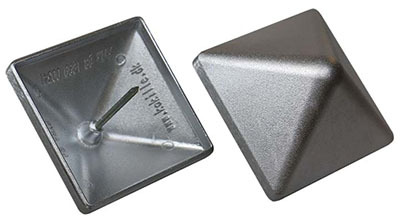 It automatically levels the cross-member with the rim joist or ledger, giving the framer a “hands free” position while installing the joist hanger or other connectors. With just a couple of twists, the Joist Jaw clamps down on its target from the top or the bottom and holds the lumber tight. 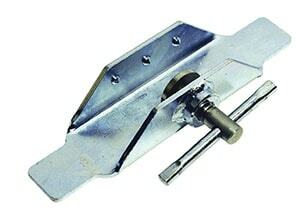 The Joist Jaw is reusable and made of durable zinc-plated steel. This tool saves time and increases accuracy whether you’re building a deck, a roof or a floor. Visit grabberman.com. Manufactured in the Midwest of all American-made structural-grade aluminum—the same as an aircraft—Last-Deck and Rail products require no staining or sealing, just mild soap and water for cleaning. The product does not split, crack, rot or mold. It’s lightweight, fire-resistant and available in a multitude of options, allowing you to design your own luxury outdoor space. 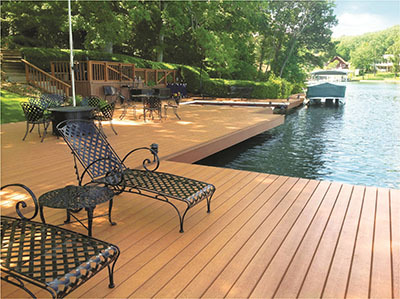 Last Deck and Rail customers have the freedom to mix and match railing, picket and deck board finishes in nine standard soft-touch colors and seven sublimated “woodgrain” finishes. If your deck is low to the ground with no need for a “dry space” below, choose the Last-Deck 100 Series. If you need a “dry space” for storage or a patio beneath the deck, choose the “watertight” 200 Series. With the “watertight” 300 Series get advantages of both; individual planks can be replaced or changed without taking apart all the planks that come before it. Visit www.lastdeck.com. Failure of the house-to-ledger connections accounts for 90 percent of all deck collapses, mostly due to the lack of proper flashing. The joint between the deck and house should always be protected from water intrusion, which can lead to further issues such as dry rot, connector corrosion, mold and ultimately deck ledger failure. 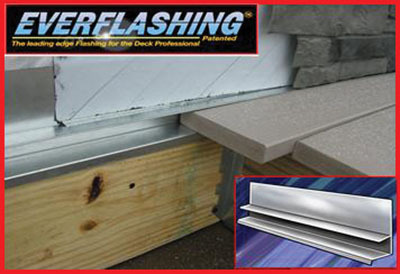 In response, Everflashing was developed as the “last deck flashing you will ever need” to greatly reduce the possibility of water intrusion. What sets Everflashing apart from other deck-ledger flashing is the extra fin that covers the tops of the floorboards. This feature provides added protection against water-borne debris and allows the floorboards—especially those made of composites—to expand and contract without unsightly gaps. Everflashing is available in G185 galvanized for use with treated lumber, color-matched aluminum for MicroPro or L3 Lumber, or stainless steel for salt-water applications. Visit www.ledgerflashing.info or www.qualityaluminum.com. 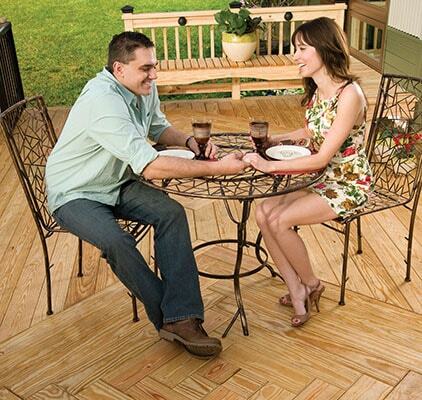 The new Deckorators Vault composite decking is marketed as having the industry’s best strength-to-weight ratio. The decking material is lightweight, easy to work with, yet virtually unbreakable. The patented Eovations manufacturing technology creates a powerful, lightweight fibrous composite that performs, feels and looks like wood—without any wood content. The result is composite decking with superior strength, stability and workability at a weight comparable to PVC decking. 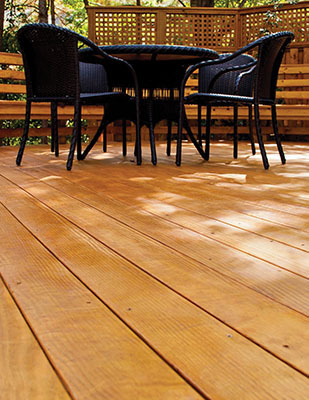 The decking is highly impact-resistant, yet it cuts, drills, shapes and fastens as easily as wood. Because it contains no organic material, Vault decking offers virtually zero moisture absorption and low thermal expansion for superior weather resistance. Measuring 7/8-in. thick by 5-1/2-in. wide, Deckorators Vault boards are available in dusk and mesquite color options, with slotted or solid-edge profiles and is backed by Deckorators’ 25-year structural, 25-year stain-and-fade and 25-year removal-and-replacement warranty. Visit www.deckorators.com/gobeyondordinary. Sure Drive USA / Pan American Screw offers a complete line of star-drive construction screws for the professional deck builder or weekend hobbyist. Big Timber fasteners meet the highest industry standards and have been thoroughly tested in independent labs, but more importantly they have withstood field-testing under the toughest conditions by thousands of contractors for over 20 years. Big Timber construction fasteners are available in a wide variety of sizes and designs to meet your project demands. The BTX general purpose corrosion-resistant, exterior screws feature a deep star-drive recess offering twice the torque of Phillips and Square drive screws. A true flathead design with self-counter-sinking nibs and a knurled shank make the BTX easy to drive, and the specially designed spiral notched thread with Type-17 cutter point works like a saw blade, slicing though even the toughest materials to prevent splitting and cracking. The Big Timber CTX construction lag screws have a built-in washer-head design as well as a deep star-drive recess that reduces cam-out and bit slippage. Available in lengths from 1 to 16 inches, these heat-treated and hardened structural lag screws are stronger and more durable than ordinary lag screws and are triple ceramic-coated for maximum protection against corrosion. Visit www.suredrive.com and www.wbsmontana.com. Too many times the structure of a deck and patio are in very sound condition, but the surface appearance makes homeowners want to give up and pay the substantial price to replace the substrate completely. United Gilsonite Laboratory has developed a new coating that is designed to give new life to those tired surfaces. UGL NuDeck Wood and Concrete Restorative Coating extends the life of a deck and patio with a paintable solution. From the can it creates a new, slip-resistant surface for decks, walkways and patios. The tintable color palette coordinates with UGL ZAR Solid Color Deck and Siding Stain to complement the color of surrounding vertical surfaces such as siding, railings, posts and walls. The product is ten times thicker than paint or stain and fills 1/4-in. cracks and nail holes. It locks down surface splinters and can be tinted in 30 different colors. Visit www.ugl.com. Making a splash in the deck-building industry, NyloDeck is lightweight, easy-to-use an contains no wood or PVC, giving it strength and durability superior to that of other decking composites. Made using 100-percent recycled carpet fiber, NyloDeck is impervious to moisture, mold, mildew and termites, making it an ideal decking product. A builder’s dream, the product spans up to 24 inches O.C. and is available in lengths up to 24 feet. Its patented three-dimensional embossing process creates a beautiful and unique finish to each of the available six colors. Visit www.nylodeck.com. 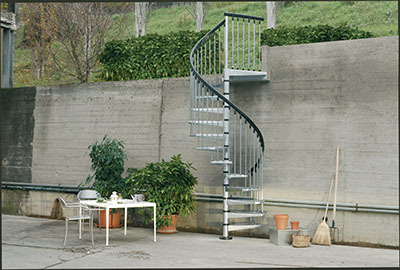 The Enduro Steel is the spiral staircase for outdoors. It combines long-term durability with high standards of quality and craftsmanship in design. 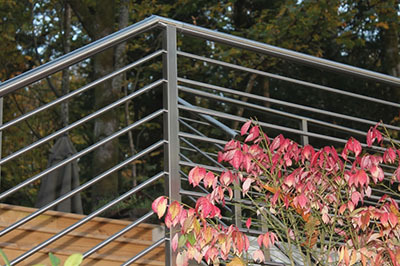 The kit from Arke Stairs includes hot-dipped galvanized steel for protection against rust and weather, stainless steel hardware, and an extruded black PVC handrail. The Enduro Steel also offers a landing which can fit a square or rectangular opening, or adjoin a header/mezzanine. The handrail is a continuous length of extruded black PVC. Written instructions and a demonstration video or DVD are included. Basic household tools are all that are needed for assembly. Visit www.arkestairs.com. 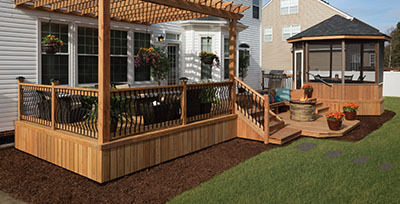 Wolmanized EraWood is the first decking product protected by a nonmetallic, carbon-based solution. The biocides used in the preservative are known to degrade in soil, meaning they are not bioaccumulative. In an era when consumers want environmentally sustainable products, natural appearance, low chemical content, low corrosivity, and effective coverage with paint and stain— without giving up performance—Wolmanized EraWood deserves a close look. The wood is protected with low-impact preservative, providing lasting resistance to termites and fungal decay and intended for out-of-ground applications. A proprietary stabilizer minimizes the effects of moisture and helps prevent warping, twisting and cracking. Visit www.wolmanizedwood.com. 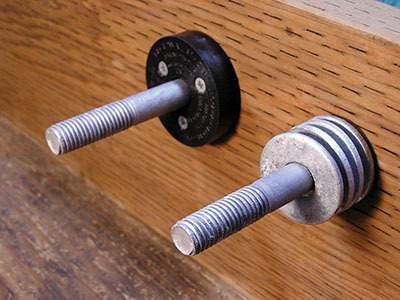 Deck2wall Spacers help prevent rot from occurring at deck-ledger connections. The spacers separate the ledger from the supporting structure, providing a path for water and debris to flow harmlessly through the assembly, while promoting circulation and drying. Stacked washers have often been used as spacers but Deck2wall Spacers have many advantages over standard washers. The Deck2Wall Spacers have attachment holes to keep spacers in perfect alignment for a faster and easier installation. They offer more bearing surface for better load distribution, and the plastic spacers are non-corrosive. Plus, the one-piece design and installation method provides superior waterproofing. The Deck2Wall Spacers also provide a long-lasting solution for attaching shade structures, posts, stair stringers, landings, built-up beams or mechanical equipment. Made in the USA, the spacers are injection molded, glass-fiber reinforced polypropylene, and now available in two sizes. Visit www.deck2wallspacer.com. ProWood Dura Color is a new advancement in treated lumber, which is color-infused, so pigment is driven deep into the wood fibers, creating beauty that’s guaranteed to stand up to the elements for years. The natural wood characteristics remain visible, unlike with paint or solid stain. Dura Color is treated with an EPA-registered waterborne wood preservative system to protect against termite attack and fungal decay. It’s also Building Code-approved for use in decking and above-ground applications, and the treatment is compatible with aluminum fasteners. Pro Wood Dura Color comes with a 2-year color assurance (no fade) limited warranty and a lifetime limited warranty against termite infestation and rot. Visit ProWoodLumber.com. 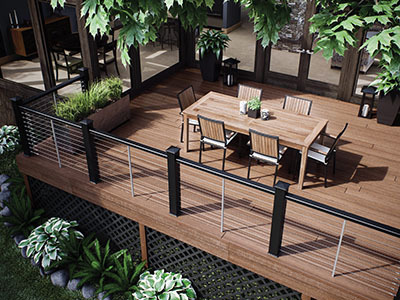 Deckorators, a brand of Universal Forest Products, offers a new sleek and versatile cable railing system, “a minimalist system capable of giving any deck a modern feel.” Additionally, the new Deckorators woodgrain cap rail offers a natural-looking finish without the maintenance of wood. The new Deckorators two-piece postcovers are perfect for fitting around existing posts or structures, turning ordinary pillars into natural-looking posts with personality. Made of fiberglass-reinforced concrete, the 42-in. pieces are available in gray cobblestone and beige stacked stone. Visit www.deckorators.com. Deck and RailTimberTech introduces a revolutionary approach to deck design with a realistic 3D iPad app that takes deck and rail visualization to a new level. 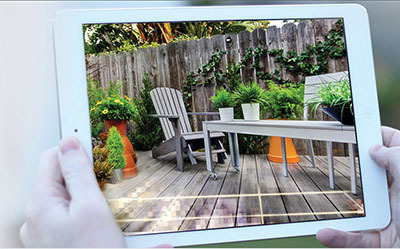 Using groundbreaking, augmented reality technology, the new app, called TimberTech 3D Deck and Rail, allows iPad users to envision their deck and rail choices right in their own backyard. The app utilizes a “visualization marker,” downloadable at the TimberTech website, to allow a user to customize each design with various TimberTech Deck and Rail products, colors and even different baluster in-fill options. It then provides an accurate 3D image of what the future deck might look like—in the exact space it will be built. With TimberTech 3D, the iPad user will simply place the marker at the desired deck location on the back of their home or on any flat area. Then, launch the app and enter the Visualizer mode to scan the marker and activate the computer vision magic. Once activated, a user can add deck boards and railing profiles in any TimberTech color and with any TimberTech railing infill. When choices are complete, a realistic image is created that allows the user to visualize their deck as if they were viewing it in their own backyard. Visit www.timbertech.com/iPad. While most stain companies are moving to hybrid or water-borne formulas, Armstrong-Clark is experiencing significant growth with a natural looking, low-VOC, traditional penetrating oil formula. Why? Because it’s long-lasting, easy to apply, and a breeze to maintain. One formula is suitable for all applications, unlike many competing products. Apply the preservative no matter how hot it is, in direct sunlight, and even when rain is coming soon. You’ll have no peeling, cracking or shiners to deal with. The two newest colors, Mahogany and Amber, have pigments specific for hardwoods that work exceedingly well on softwoods. A favorite application is Amber on redwood, cedar or treated pine. Sample cans are available in 4-oz. sizes. Visit www.armclark.com. DryJoistEZ, winner of Architect magazine’s R&D award, is the first and only structural deck drainage system on the market. Unlike traditional wooden deck joists, DryJoistEZ’s surface boards are supported by the same integrative structural design, enabling you to create a 100-percent dry area below your deck. DryJoistEZ uses only two components and is engineered for versatility, speedy installation and easy handling. Available in lengths up to 24 feet, with a spanning capability of 6 to 8 feet, DryJoistEZ is perfect for balconies and decks for both residential and commercial decking applications. 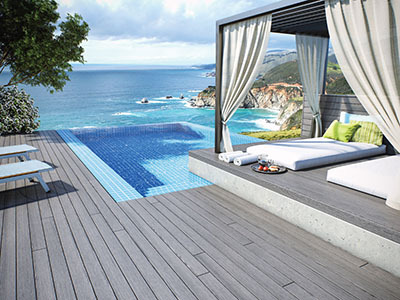 Creating a waterproof channel for your deck is no longer an afterthought to design. 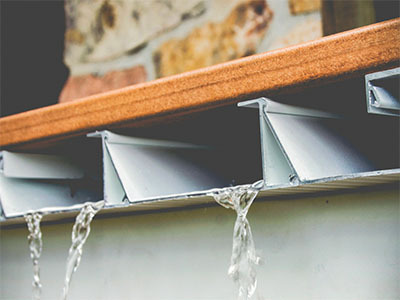 DryJoistEZ’s integrative engineering is a single system, eliminating ‘add-on’ underdeck gutter systems or drainage substructures. This 100-percent waterproof decking solution also comes with an industry-leading leak-proof guarantee. Visit wahoodecks.com.